This weekend I made my usual shopping trip to Trader Joe's. 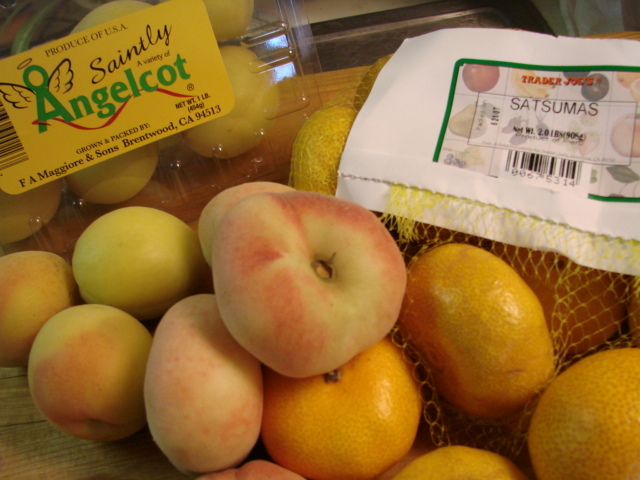 They had some fruit I'm not familiar with, Angelcots and Satsumas, so of course I had to get some. I also bought some Saturn peaches and a small seedless watermelon and some cherries. 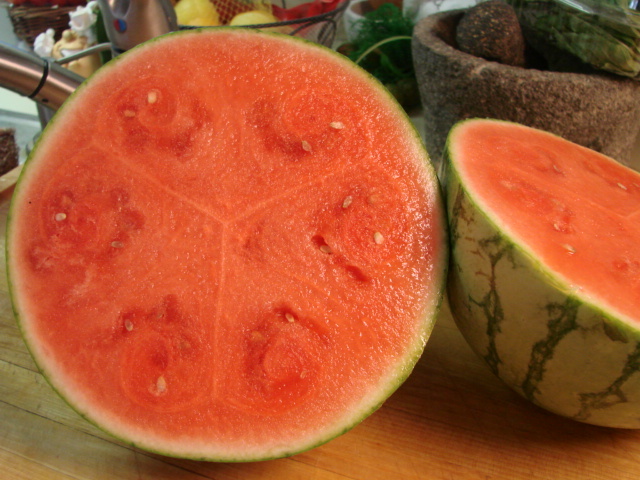 I love how the inside of this watermelon looks, just look at the symmetry of it and the color. mmmm. See the swirls and how the veins divide the melon into thirds. 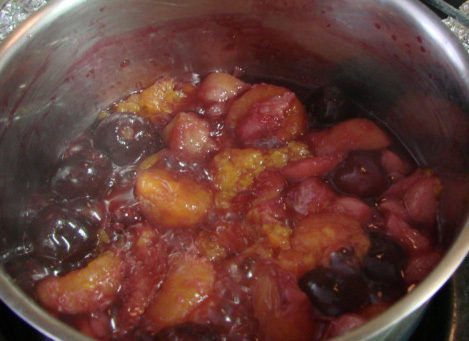 I am making a sauce of some of the angelcots, satsumas, cherries and peaches for a chicken dish I'll be making. 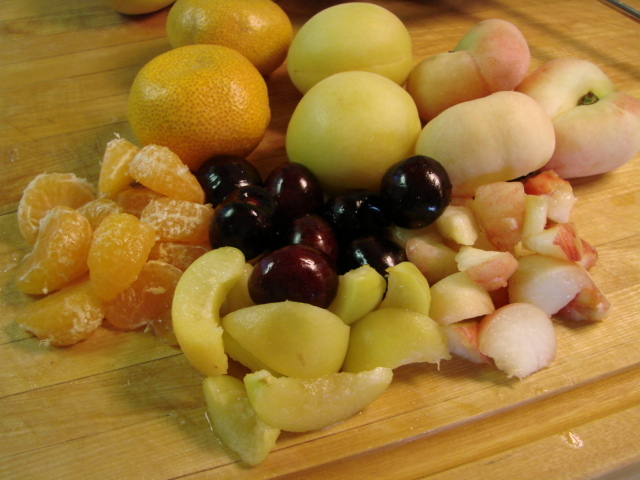 I was tempted to add some water or white wine to the fruit while they were simmering, but I left them alone so I could see how much juice they were going to give off on their own. 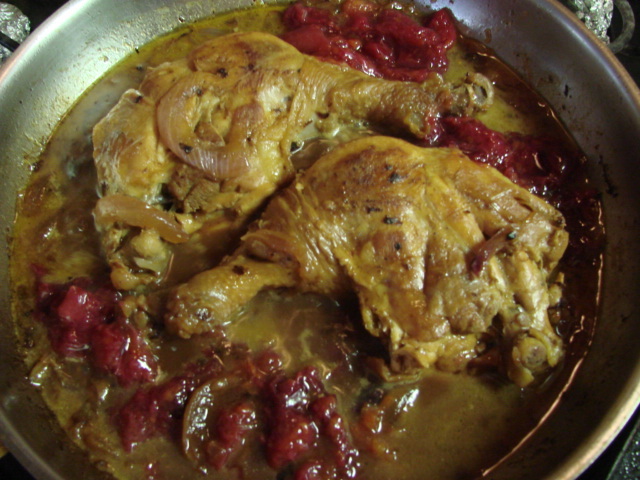 After 25 minutes of a slow simmer in a covered saucepan, lots of good juices. I will add some savory spices to this and some wine for the chicken dish. I just haven't decided how I'm going to do it yet. 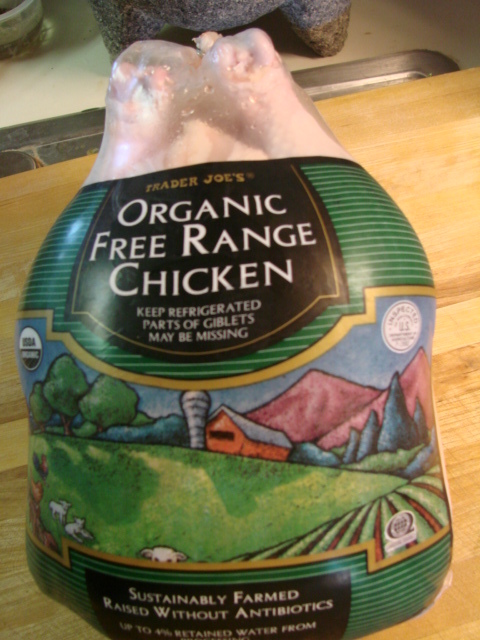 I bought a whole organic chicken from Trader Joe's to hack....ahem, cut up. 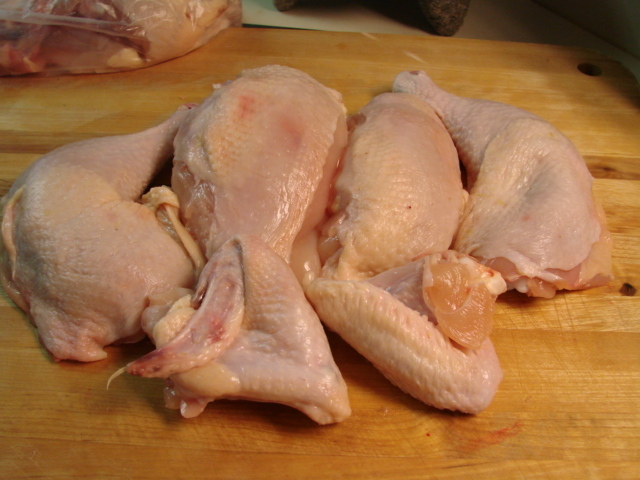 It's a beautiful chicken with nice internal pockets of fat. 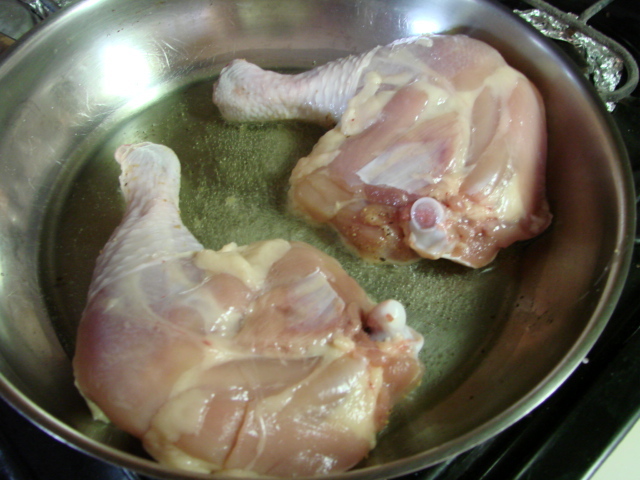 For my dish I decided to use the legs and thighs. Added a roughly chopped red onion. I thought that would go better with a sweet/savory sauce. 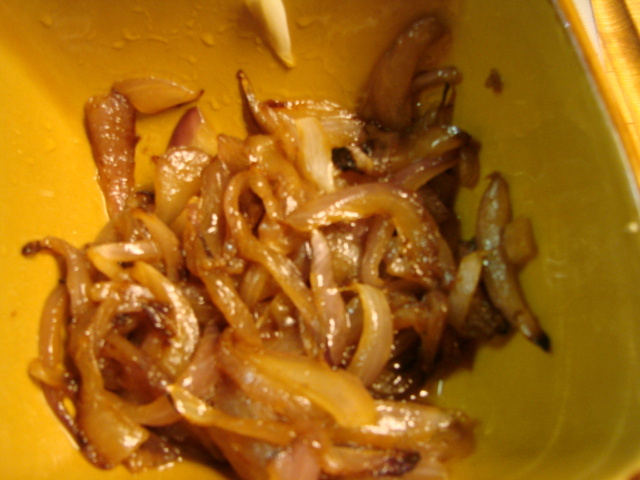 (truth..that's the only type of onion I had on hand) but, if I would have had a choice, that would have been it. 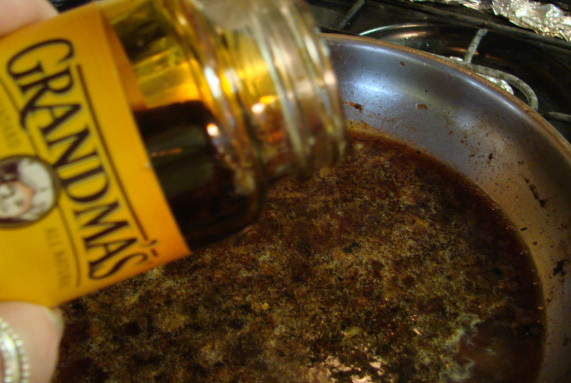 Drained off the fat from the pan and was left with a beautiful fond that I deglazed with about a cup or so of white wine. 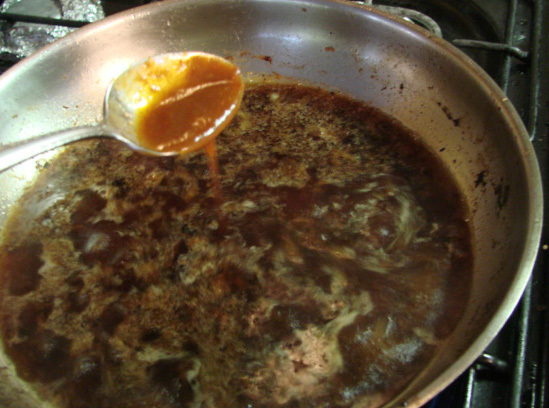 and a teaspoon of adobo sauce from a can of Chipotle peppers. 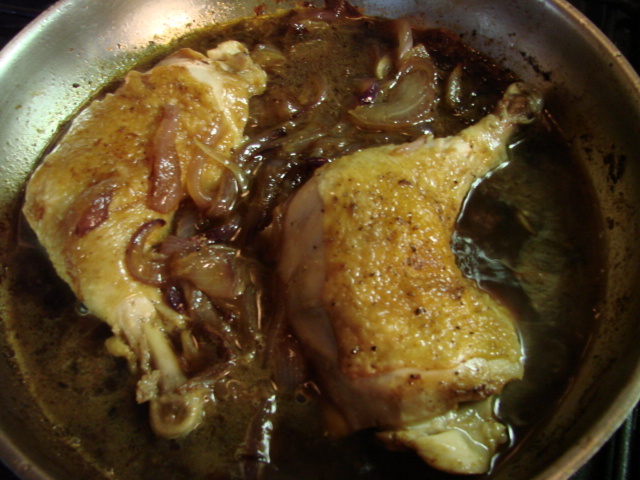 I added the chicken and cooked onions to the wine sauce. It was so delicious by now I had a hard time keeping away from tasting the sauce to make sure it was o.k. The fruits I cooked down yesterday were added and it simmered away while I nuked some green beans and re-heated some Quinoa. This turned out to be a very delicious sauce. It can be kicked up a notch depending on which way you want to go with it, sweeter or spicier. 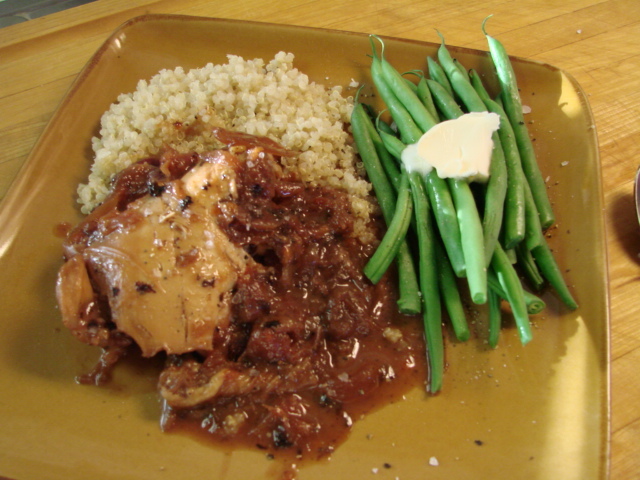 The dominant flavor in the sauce is the wine followed by the chipotle then the fruit. I will make this again playing with the spices and sweetness. I think this was a good starting point.